MANILA, Philippines — As the country celebrates Buwan ng Wika this month, a sector of society that has been lobbying for the recognition of the Filipino Sign Language (FSL) is reiterating its call. The Filipino deaf community is currently supporting lawmakers, through the help of Alliance of Concerned Teachers (ACT) Party List representative Antonio Tinio and Rep. Teddy Casiño, in passing several relevant House bills to benefit their stakeholders. Among them is House Bill (HB) 6079 which pushes for the declaration of FSL as the national sign language of the Filipino deaf. HB 4121, on the other hand, pushes for the use of sign language interpretation inset in television news programs, while HB 4631 is a bill that would give access to sign language interpreters in Philippine courts. As these Bills gain traction, leaders of the Filipino deaf community are optimistic about the progress they are making. “Yes, we are very optimistic. The progress has beenvery tremendous especially this year. The same with FSL, we want the same mother tongue-based instruction in education. There’s a lot of research and a lot of work to be done. What’s important is we have strong support, we have a strong advocacy. We want to emphasize that the deaf people also need the help of the hearing community in this advocacy,” shares Raphael Domingo, De La Salle-College of Saint Benilde (DLS-CSB) Center for Education Access and Development (CEAD), Education Access for the Deaf coordinator. 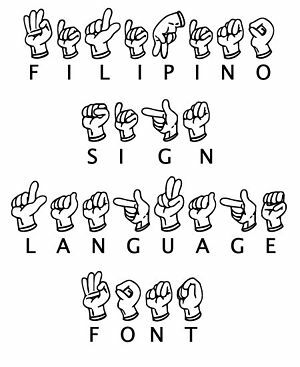 In 1907, the American Sign Language (ASL) was introduced to the Filipino deaf community through the School for the Deaf and Blind, now known as the Philippine School for the Deaf. ASL has since influenced FSL, the Filipino sign language. “FSL is a unique language. It has its own grammar, structure, syntax, which is different from the spoken language. It’s also the mark of identity of deaf Filipinos,” explains Mackie Calbay, program coordinator of DLS-CSB School of Deaf Education and Applied (SDEAS) Deaf Advocacy. FSL is believed to be part of the French Sign Language family, the sign language where most sign languages are derived from, including ASL. But like any other language, sign languages differ depending on its use and the country’s culture. “ASL has a big influence on FSL, which can be traced back to the history of the Philippines. In terms of grammar, there are differences and similarities between FSL and ASL. There are similarities in terms of hand shapes, positioning, hand location, movement, facial expression, and palm orientation. But the conversation and discourse are different depending on the culture. For example here in the Philippines, we have a sign for flooding inside the house, a term ASL does not have because they don’t experience it,” explains Domingo, who is also a member of the Special Education (SpEd) Council of the Department of Education (DepEd). He explains that the use of FSL by deaf Filipinos has increased through the years. In 2007, about 60 percent of deaf Filipinos were using ASL while 40 percent used FSL. Today, they recorded that about 54 percent of deaf Filipinos use FSL compared to ASL. Rey Alfred Lee, president of the Philippine Federation of the Deaf (PFD), says that the Filipino deaf community did not even know that FSL existed. “A lot of deaf people did not realize that they are using FSL. They know ASL but in reality they are using FSL. Naturally, if they are conversing among themselves they are going to be using FSL but if a deaf person would have to communicate with a hearing person, there’s an automatic switching of the language. So they would convert signing exact English (SEE). But if a deaf person converses with another deaf person then they will use the more natural language, which is FSL,” Lee says. Lee, faculty member of the Filipino Sign Language Learning Program of SDEAS, says that most of his students, both deaf and hearing, are surprised to discover that there is an FSL. DLS-CSB SDEAS is known for its use of FSL and advocates the use of the local language in the school and community. “The support for FSL is now stronger. The influence of the usage of FSL is slowly making waves. Hopefully in terms of the usage of FSL, it will come soon but we’ll have to work double time,” Lee shares. “The Special Education Council has made a proposal to hire deaf teacher assistants for hearing teachers who do not know sign language. The deaf assistants will facilitate communication in the classroom. DepEd is happy about that,” Domingo says. Although Domingo says that SpEd teachers are not to be blamed. “The SpEd teachers are aware of the need, however they are not readily accepting. We cannot blame them because the SpEd courses do not include FSL courses in their curriculum. So that means the SpEd teachers have no choice but to learn sign language by themselves. There are many organizations that don’t use FSL in their curriculum,” Domingo says. Currently, the Philippine Federation of the Deaf (PFD) is designing an FSL curriculum for the SpEd course in higher education. PFD will also soon work with the Japan Ministry of Education to further enhance FSL as a language. They are also in talks with the Professional Regulation Commission in licensing deaf teacher assistants to provide them with the recognition and right to benefits they duly deserve. Domingo says that they are also now working on the curriculum for the deaf, in line with DepEd’s K to 12 curriculum. These deaf community leaders hope that more deaf Filipinos recognize FSL, their native language. “SDEAS is advocating the use of FSL in the community. Hopefully, through that they could foster as sense of community and also promote excellence in deaf education. FSL is best used to have better communication. We should be using a language we could understand,” Calbay says. And they will not stop to work to further the cause of their advocacy. After all, the deaf community is fighting for their language, fighting for their identity. “ASL, being a colonial language, we don’t want it to be propagated here. Out of respect for the deaf Filipino culture we want FSL to be used here. It’s where we belong. It’s part of our own language, it’s Filipino. That’s how we communicate and understand each other, because this is what we use. If some people don’t take FSL seriously, other countries will look down at us, where is your own language? We’re proud that this is our language, this is what we know. This is FSL,” Domingo says.